Greg Reddick: Submitted my first Windows Phone 7 (WP7) application to the Application Marketplace. Submitted my first Windows Phone 7 (WP7) application to the Application Marketplace. I submitted my first application to the Windows Phone 7 Marketplace a few weeks ago. This was more or less a trial program to test the waters, see how hard the development, submission, monetizing, and ads was. 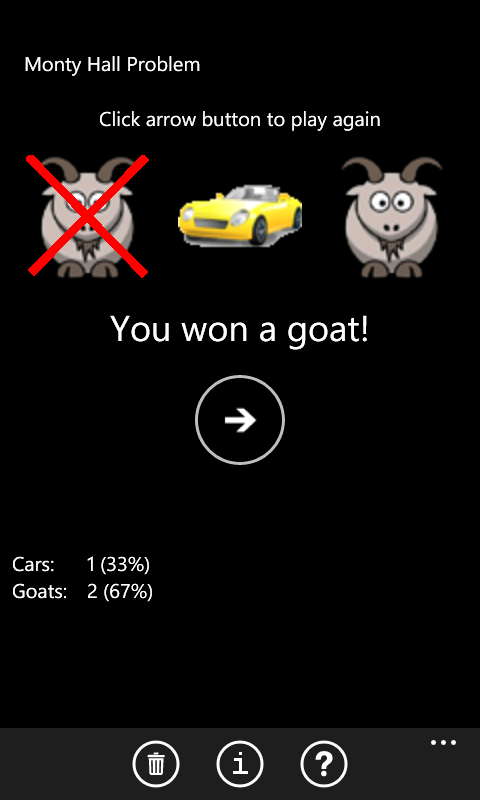 The program I decided to start with is a demo of the famous Monty Hall Problem. This is similar to the end of the program Let's Make a Deal. You are presented with three doors. 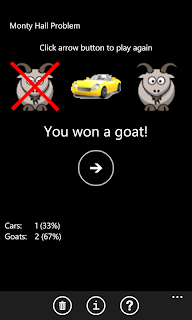 Behind one door is a car, whereas behind the other two are goats. You pick a door. The host of the program, Monty Hall, then opens one of the two remaining doors and shows a goat. You may then either keep your original door, or swap to the other remaining door. Should you stay or swap, or does it matter at all? It is actually veridical paradox, which produces a result that appears absurd but is demonstrated to be true nevertheless. I was arguing with someone about the puzzle and decided that this would be a good little program to simulate on the Windows Phone. It allowed me to write some Silverlight, put it on my Samsung Focus, and try it. Along the way, I learned how to deal with the fun of learning to Tombstone, submitting the application, how to add advertisements, and how to manage the trial version (which shows ads) versus the paid version (that doesn't). I got to set up my ad account. This program is not going to make me rich, but it actually is making at least a few dollars. Which is not too bad, since I rarely get paid for the learning projects that I do.